Dr Sedicka Laskery is an Integrative Medicine Specialist and an active member of South African Society of Integrative Medicine (SASIM). The combination of the best in Conventional Western Medicine and Complementary Medicine. She focuses on using integrated holistic interventions in the healing and prevention of medical conditions and to reach optimum balance. 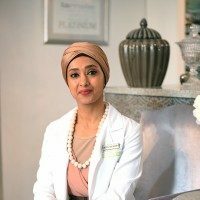 Her experiences include working in the mainstream sector (prior to embarking into specialist studies in Integrative Functional Medicine) at Groote Schuur Hospital in all departments of health and day hospitals, Mitchell's Plain District Hospital in Internal Medicine and Red Cross in paediatric medicine and emergency care. This clinical experience sharpens the knowledge of a practitioner that further ventures into a field that approaches health care from a philosophical level of holistic well-being. She developed an interest in Integrative Medicine years ago. Which was spurred on by her own personal health journey that created an inquisitive mind around exploring the medical field beyond the norm. She subsequently did postgraduate studies in integrative medicine. Integrative Medicine is the merging and practice of using the best in scientific evidence of conventional western medicine and complementary medicine to treat the underlying root causes and imbalances in our health. As an integrative medicine specialist, she uses platforms to make society at large aware of their current state of health in a very holistic and integrated approach. She acknowledges the impact of chronic diseases on people’s personal lives as well as on their work performance. She would like to assist society to gain a better understanding of their current health status in order for them to make informed decisions regarding a healthier and more balanced lifestyle. Integrative Functional Medicine allows the scope to treat current diseases simultaneously with all physiological imbalances that may be present or waiting to present themselves in all aspects of human well-being ie. Mind, body, soul and energy. Integrative medicine aims at restoring the balance and scientifically augmenting the body’s innate ability to heal itself. Supporting the innate intelligence of the body in all spheres that comprise our human make up. Perhaps even more importantly than this, is the journey, bringing personal meaning to illness as an opportunity for growth and increased awareness of self and the world. Dr Laskery believes in changing the patient's life story to a story that creates more meaning through awakening the inner self. She is of the opinion that Integrative Medicine is the best foundation for a practice in health. She joined the Renewal Institute team in 2017 and consults from the Cape Quarter, Claremont and Constantia branches.